FANFILE Page 7 they'd been tapped out under the compulsory guidance of a masked executioner. How many of them did you write?...I thought so. The best one of the batch tho, was Death in a Minor Key. This closely followed by The Telepath, then You Too 35. Nooo-Put The Telepath first. The rest of the stories weren't too good. I especially liked Ackerman's article. A couple more articles and a lot of humor would certainly pep up an issue considerably. The general format was a pip. It is, without a doubt, the best looking small size mimeo floating around... The artwork was all good, the best single piece being the illustration for Death in a Minor Key. The Denvention ad placed second... O'Brien is good! More poems... I really can't imagine a more pleasing fanzine... Letter from Lou Goldstone, reading in part: "One suggestion in regard to [underlined] FMZ DIGEST: Why not provide some sort of index at the back with addresses, periodicity and princes of the mags whose material you reprint?..." This led to the feature "The Information Desk" in FMZ DIGEST. Letter from Speer, printed. Note from Perdue, re nothing in particular. Letter from Harry Warner Jr., dated April 22, 1941: Glad to hear from you, both literally and figuratively. Figuratively in the sense of your letter; literally in the sense of the two LASFS recordings which finally wended their way around to me... Second FMZ Digest received, and is every bit as good as the first... Your selections are on the whole good, the digesting very adroitly done... Particularly glad to see Koenig's words put where they can be seen by more than the fifty FAPAers, most of whom do't need them anyway... Your chain letter arrived and was promptly passed on. A swell idea and one that must be perpetuated... Card from Art Widner Jr., dated 4-22-41: "The serial letter just whizzed thru Bryantville this morning, and I made a pass at it with my typewriter and deflected it tuckerward. Thot you might like to know how your brain-baby is getting along." 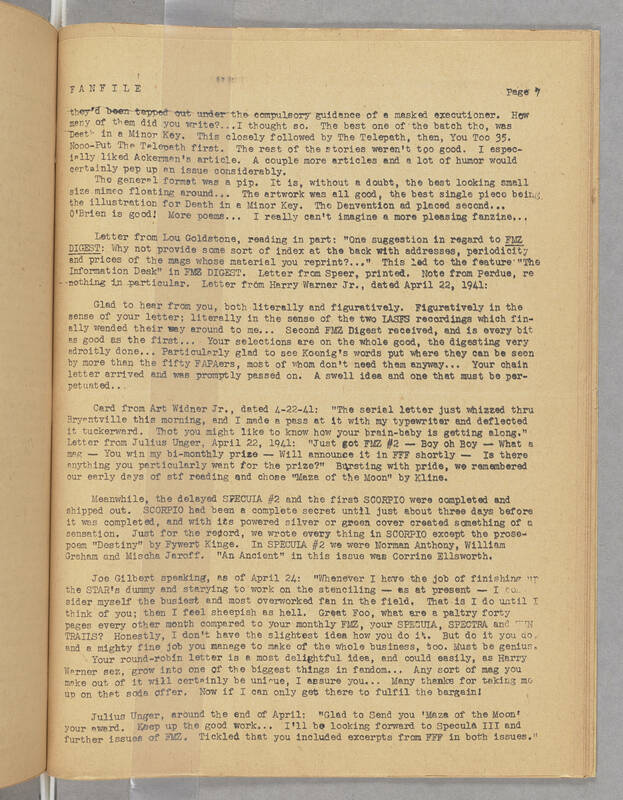 Letter from Julius Unger, April 22, 1941: "Just got FMZ #2 -- Boy oh Boy -- What a mag -- You win my bi-monthly prize -- Will announce it in FFF shortly -- Is there anything you particularly want for the prize?" Bursting with pride, we remembered our early days of stf reading and chose "Maza of the Moon" by Kline. Meanwhile, the delayed SPECUIA #2 and the first SCORPIO were completed and shipped out. SCORPIO had been a complete secret until just about three days before it was completed, and with its powered silver or green cover created something of a sensation. Just for the record, we wrote every thing in SCORPIO except the prose-poem "Destiny" by Fywert Kinge. In SPECULA #2 we were Norman Anthony, William Graham and Mischa Jaroff. "An Ancient" in this issue was Corrine Ellsworth. Joe Gilbert speaking, as of April 24: "Whenever I have the job of finishing up the STAR's dummy and starying to work on the stenciling -- as at present -- I consider myself the busiest and most overworked fan in the field. That is I do until I think of you; then I feel sheepish as hell. Great Foo, what are a paltry forty pages every other month compared to your monthly FMZ, your SPECULA, SPECTRA and SUN TRAILS? Honestly, I don't have the slightest idea how you do it. But do it you do, and a mighty fine job you manage to make of the whole business, too. Must be genius. Your round-robin letter is a most delightful idea, and could easily, as Harry Warner sez, grow into one of the biggest things in fandom... Any sort of mag you make out of it will certainly be unique, I assure you... Many thanks for taking me up on that soda offer. Now if I can only get there to fulfil the bargain! Julius Unger, around the end of April: "Glad to Send you 'Maza of the Moon!' your award. Keep up the good work... I'll be looking forward to Specula III and further issues of FMZ. Tickled that you included excerpts from FFF in both issues."